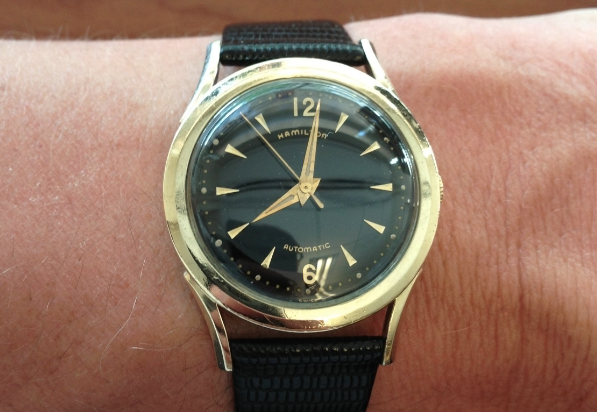 Automatic or self-winding watches entered Hamilton's lineup in 1954 and have had a considerable presence ever since. By 1956 there were almost twice as many Automatics than in 1954 with over 20 models to choose from. That number would double again by 1960. 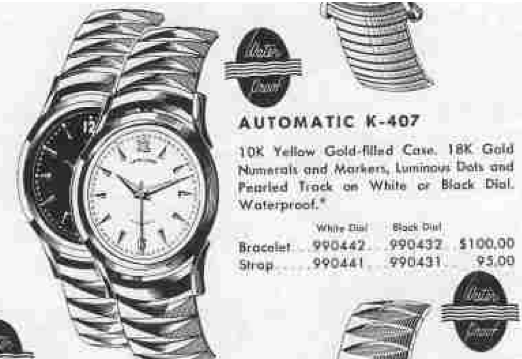 One of the earlier Automatics introduced in 1956 was the Automatic K-407. It was produced for only two years. Like other watches of the period, the K-407 came in a choice of a white dial or a black dial. Both have luminous hands and dots outside of the solid 18K gold hour markers. Under the dial you'll find Hamilton's 17 jewel 661movement. All Hamilton automatics were made by a variety of Swiss manufacturers. The 661 was made by Certina Kurth Freres and is a caliber 28.45. The K-407 comes in a 10K yellow gold filled case with gold filled back. The crown is recessed into the bezel and is barely visible when it's in the winding position. This is a tricky watch to wind by hand since you can only really access one side of the crown. Perhaps that's why it was only produced for two years. The good news is it's self winding so after a few turns of the crown the watch starts running and will continue to wind as you wear it. I've had both versions of the K-407 and I think they are each very cool in their own ways. I think the black dial is more popular and it really makes a presence on the wrist with the contrasting gold case, markers and hands. Here's a photo of the white-dialed version, before I changed the crystal - you can see it's cracked near the 7 marker. I know the post is over one year old, but any chance the black dial version is available for sale? Hi! Dan. I have what I believe is a K-407 with some slight differences. First, I don't have a seconds hand and the face is gold colored not white or black, did they make the K-407 like this or do I have another model? I suspect your second hand is missing. 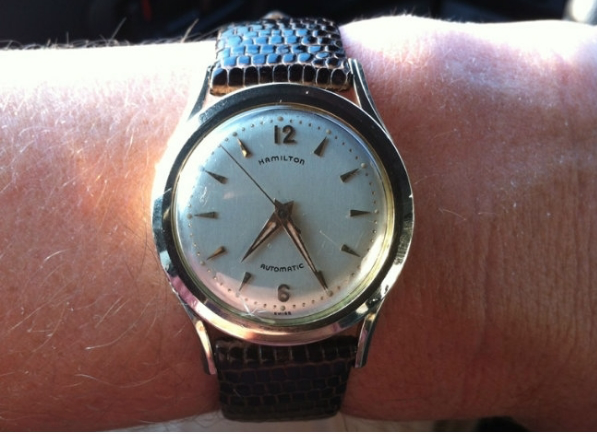 The dial is probably a refinish or toned by nicotine or age. Hard to say without seeing it.